With Chinese New Year celebrations taking place this week, honouring the Year of the Pig, food will play a key role. 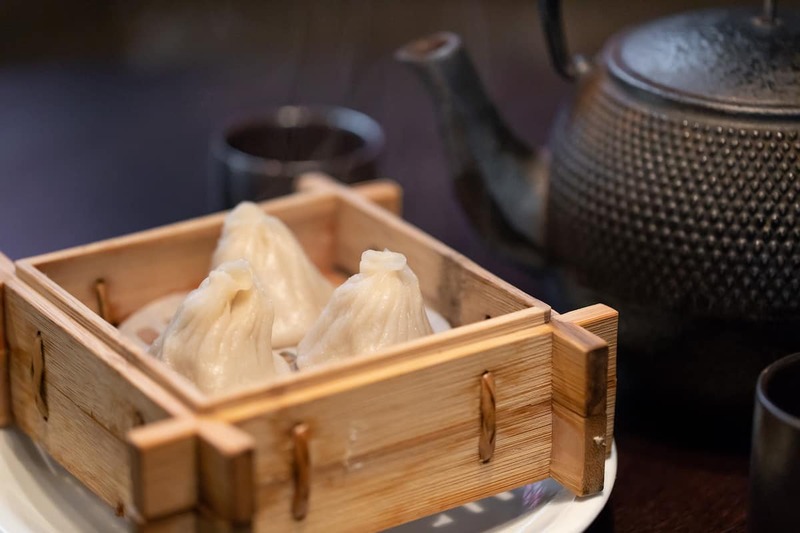 And with xiao long bao – Shanghainese soup dumplings – having been the subject of much attention of late, Chinatown restaurant Plum Valley’s pork and crabmeat soup dumplings are a fittingly porcine treat. Although Plum Valley Head Chef A-Zhong’s recipe features numerous processes (the folding process can be particularly tricky), the end product is both rewarding and transcendently delicious. Alternatively, the delicate xiao long bao are also available from the restaurant, served all year-round. Combine the pastry ingredients together, stirring in the water slowly and knead to form a dough. Roll out into a thin sausage and cut into small cubes, the size of a 50p piece. Then press each into a round, thin circle to use later. (Can use rolling pin). Place the pork ribs into a stock pot and cover with cold water. Bring to a boil. Cook for about 2 minutes or until foam begins to float to the top. Empty the content of the pot into a colander and rinse the bones thoroughly with cold water. Clean the pot thoroughly as well. Return the cleaned pork ribs to the cleaned stock pot. Add spring onions, ginger, wine, and water. Bring the pot to a boil then reduce heat to a low simmer. Occasionally skim the surface of any foam that floats to the top to keep the stock clear. Simmer on low for about 1.5 hours or until liquid reduces to half. Strain liquid into a 13×9 inch baking dish and discard the solids. Cover with plastic and chill in fridge until set (at least two hours). Once set, cut a crosshatch pattern into the jellied soup. Mix the meat filling with the diced soup jelly in the proportion of 1:1. Place the filling in the middle of the round pastry and fold (this is the hardest part, a good xiao long bao should have between 16 and 20 folds). Place in a basket and steam your xiao long bao for 4 and a half minutes. Further information on Plum Valley can be found here.